I've been to several parts of Canada, including Montreal, Whistler, and Banff. But for no particular reason, I've never found my way to Toronto. I'm glad to say I finally planned a long weekend over our July 4th holiday, and I’m very happy I did. Toronto is a well-balanced, medium-sized, cosmopolitan city on the shores of Lake Ontario. It's clean and well-organized, and a long weekend provides just enough time to explore its varied neighborhoods and attractions. Additionally, visitors can't help but notice the surprising ethnic mix of the city; it is as diverse as many U.S. cities, and this no doubt adds to the city's energy and entertainment offerings. Speaking of entertainment, my visit coincided with both Canada Day (when residents celebrate the 1867 union of its three British colonies into one country) and Toronto’s Gay Pride weekend. At customs, the official asked if I was visiting for the festivities. I asked, "What festivities?" Well, I was in for an unexpected treat. Canada Day is celebrated much like our Independence Day festivities, with fireworks and outdoor concerts. Toronto’s Gay Pride Fest is a 10-day bash packed with parades, entertainment, and street parties. The major festivities kicked off Friday, July 1 and culminated in the Pride Parade on Sunday, July 3. Although it's Canada's business capital, Toronto has a more relaxed and European vibe than Manhattan – akin to San Francisco, but without the hills. Plus, the country’s dual languages (French and English), foreign currency, and dearth of fast food and chain restaurants (thankfully) lend it an international feel. 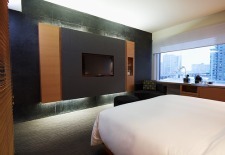 I stayed in Toronto at the brand new (opened November 2010) Le Germain at Maple Leaf Square, and I loved it. It’s a sleek, contemporary property that’s close to the water, the Air Canada entertainment center, and downtown; by taxi, most of the city is easily accessible. I’d call Le Germaine a smart luxury pick that offers top notch comfort, elegant design, and outstanding service. Gregory, the property’s experienced concierge, perhaps best demonstrates the hotel’s impeccable hospitality: When my friend and I went out to dinner at night, Gregory arranged for a driver to take us out in the hotel’s new Audi A8 Sedan, which is a stunning vehicle. Throughout our stay, he helped us figure out what to explore, jotted down attractions on the map, made dinner reservations, and answered my usual assortment of questions (of which I had many). He was terrific and made our stay particularly special – something you won’t find in a larger hotel! Note that there are two Germaine properties in Toronto, and they are both marvelous. Le Germaine Toronto is downtown and has a contemporary luxury décor – think rich textiles and dark wood furnishing. The only drawback there might be the weekend congestion near the clubs on the same street. For more old-world luxury, consider the Four Seasons or the Park Hyatt (both in Yorkville), and Le Meridian, which is in the city's financial district. See our Toronto Travel Guide for more trip-planning information, then use our Travel Search price comparison tool to find the lowest rates on flights, hotels, packages, and more travel deals.